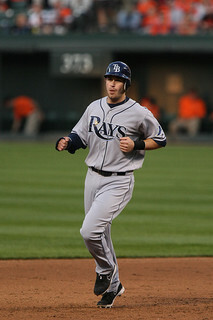 Christopher Carelli: With Evan Longoria back, can the Tampa Bay Rays duplicate their 2011 finish? With Evan Longoria back, can the Tampa Bay Rays duplicate their 2011 finish? The last day of the 2011 MLB regular season was one of the more extraordinary days in the history of the game. There were multiple games played which resulted in the culmination of truly great late season surges and collapses and one of the teams involved in last season's spectacle is very much in the same position as they found themselves at this time last season. Actually, they are better off, which should be scary for the teams they'll be chasing for a postseason berth. 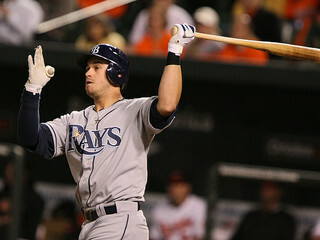 The Tampa Bay Rays were last season's American League Wild Card winners after a 32-17 surge which began August 8, 2011. They were ten games back of the New York Yankees in the wild card race prior to that day and wound up catching the Boston Red Sox after one of the more magnificent collapses in recent memory. The Rays have become synonymous with being underestimated, though the degrees to which they have been labeled an underdog have lessened over the last few seasons (deservedly so). 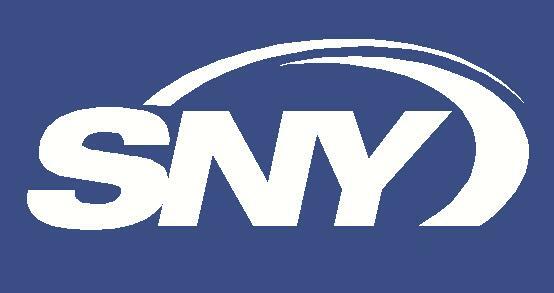 This year, they have managed to stay toward the top of the American League East standings and the wild card race despite playing 85 games without their best player, third baseman Evan Longoria. Believe it or not, they're in better shape now than they were a year ago today in the standings, even with the loss of Longoria for a majority of the season. Longoria just recently returned to the field, as a DH for the time being, and it couldn't have come at a better time for the Rays. The club ranks last in MLB (tied with the Oakland Athletics) with a .230 batting average and 26th with a .687 team OPS. However, their pitching staff has kept the team within striking distance all season. The Rays' hurlers rank 4th as a group with a 3.45 ERA and have held opposing teams to a .235 batting average. They are playing true to their Pythagorean Record at 57-52. Recently the offense has been in an even larger funk than normal. Since an eight-run "explosion" against the Oakland Athletics on July 31, the Rays have scored a total of ten runs in their last five games. However, the team is 3-2 in those games. Imagine if this team could hit. Rays manager Joe Maddon suggests that Longoria's return should come with tempered expectations. "When a guy like Longo comes back, people are really going to read into it and heap all these unnecessary, unreachable expectations." While Maddon's words ring true, it's certain that he hopes, as do Rays fans, that Longoria's presence in the lineup at the least forces teams to approach their lineup differently. While it may be a bit before Longoria returns to his potent hitting self, if he does he can certainly carry a team. Provided the Rays receive similar production from their pitching staff they can make a run at the division title and could easily make up the 1 1/2 games they are back in the wild card race heading into today's game. There is no reason to think that their pitching will not hold up and right now the staff is on fire. Since the All-Star break (23 games), Rays pitchers have been downright stingy as a group, leading Major League Baseball with a 2.28 ERA, 233 strikeouts and an opponents' batting average of .198. They have received excellent work from David Price (14-4, 2.49 ERA) all season and James Shields tossed eight innings of one-run ball yesterday increasing his record to 10-7, one outing after recording a complete-game shutout. Jeremy Hellickson (6-7, 3.43 ERA) has pitched better than his record indicates and Matt Moore (8-7, 3.84 ERA) is working on a scoreless streak of 17 2/3 innings going back three starts. It is not just the rotation that has carried the load; the bullpen led by closer Fernando Rodney, has been extremely effective as well. Rodney has 33 saves in 34 chances with a minuscule 0.70 ERA and is in the midst of a 22-inning scoreless streak. With a shutdown closer and starters giving plenty of innings the Rays should be a force to be reckoned with for the remainder of the season with or without increased offense. That said, having Longoria back in the lineup provides the Rays with much needed pop and takes some pressure off the rest of the lineup. During Longoria's time on the disabled list, Carlos Pena (.196, 15 HR and 46 RBI), Matt Joyce (.270, 12 HR and 38 RBI), Ben Zobrist (.251, 12 HR and 43 RBI), Luke Scott (.225, 12 HR and 45 RBI) and Pena have been the run-producing bats. Desmond Jennings, B.J. Upton and Elliot Johnson have provided speed on the bases with 20, 19 and 17 stolen bases respectively. The problem is, of the three players, Johnson has the highest OBP at .315. The Rays elected not to make a major splash at the trade deadline, opting only to grab utility player Ryan Roberts from the Arizona Diamondbacks. Roberts could provide some extra offense if he is able to find his form from last season. While Longoria may take some time to get back to full strength, he's still instantly the best hitter in the lineup. Opposing teams will find it just a bit harder to navigate the lineup and it is possible Longoria's bat ignites the rest of the group into an eight-week surge much like it did last season. It was Longoria's homer that launched the team into the playoffs last season during the final at-bat of the final game of their regular season schedule and his return from injury this year may be just what the team needs to make another run to the postseason. Maybe this time it won't need to be so dramatic.